Anish Kumar. 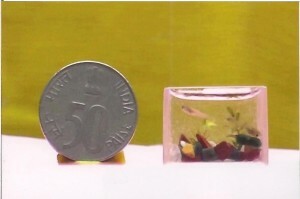 P (born on May 17, 1990) of Kanyakumari, Tamil Nadu, India, has made an aquarium of glass, consisting stones, plants and several small fishes ,measuring 22mm wide, 16mm high and 13mm deep on January 17, 2012 at Nagercoil, Kanyakumari, India. Comments for Smallest Fish Tank are now closed.